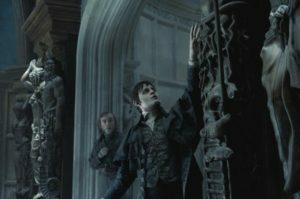 Warner Bros. have released three images from Tim Burton & Johnny Depp’s next film together, Dark Shadows. From SFX. Price budgeting is not an option. At least according to John Carter Director, Andrew Stanton. In an interview with BBC News he talks about large film budgets, and how he didn’t pay attention to the price of making John Carter. BBC News takes a look at movie trailer voice overs and the overwhelming dominance of male narrators. SFX have an interview with The Hunger Games Director, Gary Ross. Take a look at a sneak peek at an interview with Joss Whedon in the upcoming issue of SFX magazine that’ll feature a large spread on The Avengers. Maleficent, starring Angelina Jolie, and featuring a villains point of view of the events of Sleeping Beauty is due to start shooting in London in June. From The Hollywood Reporter. SFX has a story about three more graphic novels set to hit the silver screen in the future. Because Hollywood has run out of its own ideas and is now trolling graphic novels for something new and fresh. This is not a bad thing. Take a look at footage from Lockout the new film from Leon and The Fifth Element Director, Luc Besson. From SFX. Empire have a look at a new trailer for the long anticipated Cabin in the Woods from Joss Whedon and Drew Goddard.